Peter and Sylvia are on Can Pyran. This is our floating home – you are welcome aboard. Can Pyran is Cornish for St. Pyran’s Song. She is a Wylo 32 designed by Nick Skeates and her steel hull was built in Penryn by John Thomas. We did the fitting out ourselves. St. Pyran, who is the patron Saint of Cornish miners, worked in his earlier years as adviser to the King of Ireland. Unfortunately they disagreed when the king wanted to swap his wife for a young serving wench and Pyran was thrown off the Irish cliffs in a raging storm tied to a millstone. As he fell the storm abated and the millstone floated to the coast of Cornwall, where he held a good party or two to celebrate. We feel these are all useful attributes so we invited him to join us aboard. 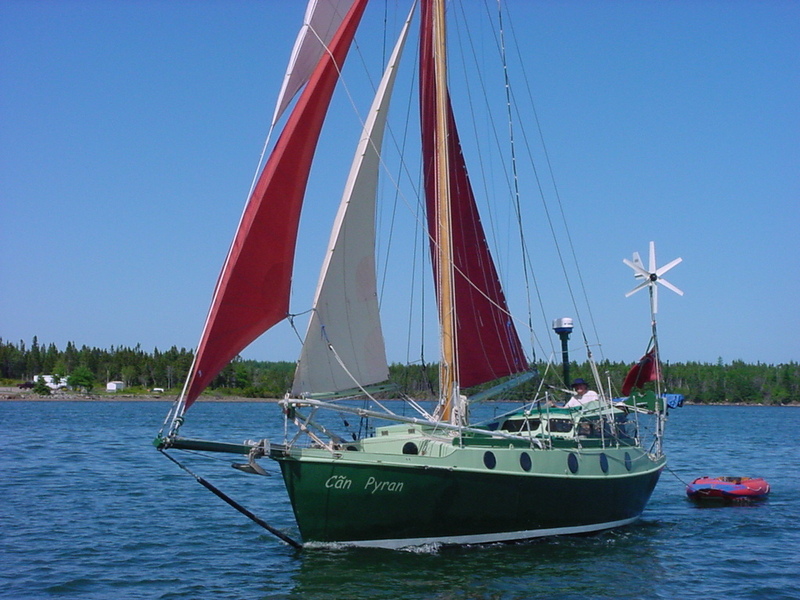 Can Pyran has been our home for the better part of 10 wonderful years, in which time she took us across the Atlantic via the Cape Verde islands to the Turks and Caicos islands, and then on to Maine and Nova Scotia. We then re-crossed the Atlantic via the Azores, and visited Ireland before heading down the West coast of France and through the Canal du Midi to the Mediterranean. We spent some time there, and brought Can Pyran back to her home port, Calstock last year. We are now living on land for good, and in Grandparent mode, so Can Pyran needs a new owner to take her long distance cruising which is what she was designed and built for. We shall keep her for coastal cruising until the right buyer comes along, but she’s a working boat, not a toy, and needs to work.